Looking to impress with their array of fusion shoes this year, the Jordan Brand is set to release the first of three colourways of the Jordan CMFT 11 Viz Air that is expected to start the fusion frenzy this year. Featuring combined features of the Air Jordan XI and Nike Air Max 1, the first edition of the Jordan CMFT 11 Viz Air will come out in Anthracite/Volt-Black this Saturday, January 15, and you should not definitely miss it. 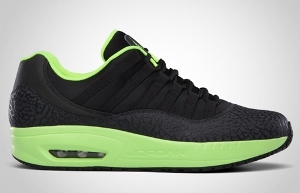 The shoe boast an all-black look enhanced with the strong appeal to the eye of the neon green shades. Impressed? So start saving your money and watch out for its release this Saturday!